In the honors degree program at Rollins College, academically gifted students get the chance to explore critical issues in science, technology, arts, humanities and social sciences through the lens of a liberal arts education. Honors program students attend small and interactive seminars together in which they will be challenged to apply their intellectual gifts to studying, understanding, and solving crucial problems facing our world today. Special dinners, immersions, intersession courses, community engagement projects, and speakers help to further the sense of community. 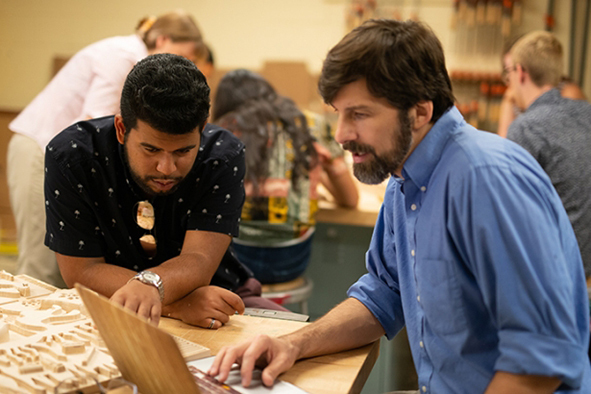 The culmination of the honors program is the senior thesis project, ideally in the student’s major field, although interdisciplinary thesis projects are also possible. This capstone thesis leads to exceptional depth of understanding and provides valuable experience in developing and executing an advanced project. Students interested in the Rollins honors degree program do not have to fill out a separate application to be considered for the program. All applicants will be evaluated for the honors program during the application review process. The honors degree program is a highly selective program which is awarded on an invitation-only basis. The top 4 percent of our applicant pool will be evaluated by the honors faculty committee, and students who are selected will be sent an invitation to join the honors degree program in late spring. Upon enrollment, professors will also have the opportunity to nominate students for the honors program based on their outstanding performance during their first year at Rollins. The Honors Degree Program creates a community of scholars who are encouraged to seek innovative ways to solve the pressing social challenges of the twenty-first century. The Honors Degree Program exemplifies global citizenship in its very mission, by encouraging you to pursue “you, beyond you,” by which we mean striving to create identities that are focused not on personal success but on using the gift of intelligence to solve pressing social issues and contribute to the greater good. We do this by organizing the curriculum to encourage study abroad (you can complete your core requirements before junior year), and we privilege classes that tackle big questions and global issues and that have a community engagement component. Honors students typically arrive at Rollins with a strong resume of leadership opportunities. Many of you have already been newspaper editors, student government presidents, captains of sports teams, and founders of service initiatives. In our Honors community, we seek to underscore the “responsible” elements of leadership by encouraging you in a mode of learning and contribution that emphasizes communication, ethics, and integration. You will be well placed to pursue a productive career after graduation. Many of our students go on to graduate study at institutions like the University of Washington, Tulane Law School, Penn, Harvard, Georgetown, and the University of Virginia. Those students not in graduate school are working as analysts, managers, writers, and engineers in corporations including Target, Disney, and Siemens Healthcare. Many students report that work on their honors thesis offers an important leg up in interview settings, where they can demonstrate appealing skills of self-direction, written and oral communication, and asking then answering a big question. We have also designed career-planning activities to support you throughout the program. In terms of meaningful lives, one of our goals is to encourage you to become a lifelong learner who is comfortable going outside of your discipline to learn from others. Our capstone class, called Your Last Lecture, is an excellent example of this principle. In this class, you will listen to professors and professionals from multiple disciplines give lectures about topics they are passionate about, learn to deliver a professional lecture, and then give your own lecture to a local community partner. You learn to communicate big ideas with people who are outside your field, because if important ideas are not shared in an accessible way, the general public cannot benefit from them. The honors degree program curriculum is a carefully planned sequence of seminars beginning with the honors conference seminar in the first semester and continuing through interdisciplinary seminars that challenge students to incorporate knowledge gained in their major studies in conjunction with their peers to address contemporary problems. I attended Cornell University for my undergraduate education and then received my Ph.D. in English from the University of California, Los Angeles. My research and teaching focus on embodiment and the medical humanities, leading me to teach courses like "Bodysnatchers: Literature and Medicine" and "Gruesome Anatomy." In 2010 I published a book called Reading Embodied Citizenship: Narrative, Disability, and the Body Politic (Mellon American Literatures Initiative, Rutgers University Press). Currently, I am working on a manuscript tentatively titled "Transplant Fictions" that explores how organ transplantation has been imagined over time.